In a saucepan, bring chicken broth to a simmer. Keep warm over low heat. In a large saute pan, melt butter over medium heat. Add oil and rice and cook for 2 minutes, stirring to coat each grain. When rice begins to make a crackling sound, add saffron threads. Add 1 cup of the warm chicken broth and cook, stirring, until the rice has absorbed the liquid. Add the remaining broth, 1 cup at a time. Continue to stir, allowing the rice to absorb each addition of broth before adding more. Test the rice for doneness, it should be al dente but creamy. 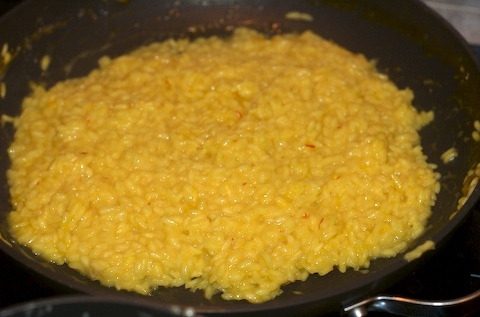 Remove risotto from heat, add grated cheese, salt and pepper. Serve at once with Osso Buco Milanese. Posted on August 9, 2012, in Uncategorized. Bookmark the permalink. Leave a comment.